James Tissot was an individualist whose style and brushwork was neither entirely Academic, according to his training, nor always fashionable, though some of his oil paintings feature looser, more Impressionistic brush strokes. Though he did not establish trends, he absorbed them into his repertoire and transmuted them into a virtuoso formula all his own. He made his début at the Paris Salon in 1859, and hit his stride as an artist by the Salon of 1864, with The Two Sisters and Portrait of Mademoiselle L.L. In his self-portrait the following year – nine years before his friends joined together to exhibit paintings in a style that would be called “Impressionism” – which was not displayed in public, Tissot delineated his features and clothing in ultra-modern, swift, painterly brush strokes against a minimalist, sketchy background. But when he received private commissions for portraits of French aristocrats during the Second Empire, he combined his mastery of high finish with his consummate confidence in making his most adroit brush strokes visible. One of the foremost examples of Tissot’s remarkable brushwork is the ruffled edging of the pink peignoir in Portrait of the Marquise de Miramon, née, Thérèse Feuillant (1866). The ruffles, which appear so precise, are graceful, curling strokes of a loaded, round brush. The folds of the silk velvet dressing gown are thick broad swathes of color, underscored by a right-to-left flutter of white that creates the petticoat peeking underneath. Zoom in on all the luscious detail here. In Portrait of Eugène Coppens de Fontenay (1867), a series of a half-dozen thick white curves defines the convex glass cover of the clock’s face. Rather brilliantly, they are flanked by white in the background and in the foreground – on the left, the lightly-suggested white, back-lit curtains dressing the window reflected in the mirror over the mantel, and on the right, the bold white of shapes of Fontenay’s collar and waistcoat. Using his brush to apply white paint in different ways, Tissot has defined three-dimensional space on his canvas. The perfectly placed dry brush strokes that Tissot used to define the volume of Gus Burnaby’s black leather boots and give them their astonishing gleam in Captain Frederick Gustavus Burnaby (1870) are riveting when viewed at close range. This painstakingly-detailed portrait was another private commission, this time from a friend in London, his home from mid-1871 to late 1882. The seated woman’s flowing hair in Autumn on the Thames (1875) is one of the most enchanting details in Tissot’s work. With the lightest of touches from his brush, he has made us feel the river breeze as it ripples through her ethereal locks. Though the figures are highly finished and the palette is that of an Academician, note the looser style in which Tissot painted the water, grass and background landscape. This picture was not exhibited in public. More in the style of his friends in Paris were two other paintings that Tissot did not exhibit, On the Thames, A Heron (c. 1871-72) [figure a] and The Fan (c. 1875) [figure b]. While the figures and their costumes are completed to a high finish and both are painted in a studio rather than en plein air, the landscape backgrounds are rendered in brisk, suggestive strokes, and there is a new sense of movement. Click here to zoom in on Tissot’s brushwork in On the Thames, A Heron, and pay particular attention to the rippling water and the heron; also see A Closer Look at Tissot’s “The Fan”. Tissot remained, at heart, a painter in the Academic tradition; he was not an Impressionist, concerned with the shifting effect of natural light, vivid colors, and capturing the fleeting experiences of contemporary life as they did. The Japanese influence in these two paintings is what makes them contemporary. But as a Frenchman who had emigrated to England after the bloody Paris Commune [see Paris, June 1871], he hardly could have entered canvases painted in “the modern French style” to the annual exhibitions of the Royal Academy. The Bunch of Lilacs (c. 1875), one of two paintings he exhibited at the Royal Academy that year, was more conservative. Tissot conjures the reflection of a dense array of vegetation and Oriental accessories on a foreshortened grid of decorative tile. His sure brush creates the ultimate polished floor as a stage for this carefree bird of paradise. Hush! (The Concert, 1875), the second picture Tissot exhibited at the Royal Academy that year, also was highly finished. Note how he painted the chandelier’s multitude of glittering, highly-defined crystal pendants quite differently when reflected in the mirror. Holyday (c. 1876) was one of several paintings Tissot exhibited in 1877 at the exclusive, innovative new Grosvenor Gallery, for which he eschewed his regular showings at the Royal Academy. Tissot turned the dark shape of the pond into shining water by deft white strokes (as well as floating lily pads) defining the surface, and reflections of the man, woman, tree and cast-iron columns in the background implying its depth. This treatment of the water, as well as the background of the picture space, is far more finished than that in Autumn on the Thames. At the same time, Tissot now was, or was giving the impression of, painting en plein air. In Evening (Le Bal, 1878), the cascade of layered ruffles is a tour de force of Tissot’s ability to define precise, minute folds of fabric, shaded and highlighted and juxtaposed with contrasting trim in related hues. His lively brushwork lets us feel the volume, weight, and movement of that train. The highly accomplished French painter succeeding wildly in London despite the British critics carried on, experimenting with brush techniques while staying true to his Academic background. In A Winter’s Walk (1878), Tissot painted the fur and the foliage in quick, overlapping strokes of varied hues, dragging out the color of the fur with a stiff, dry brush to indicate its soft texture while blurring the edges of the greenery to indicate its rough texture and its distance in the background. He rendered the rich, heavy dress fabric by laying on tints and shades of color with a broad brush, and he enlivened the sober palette with a flash of gold in the captivating detail of Kathleen Newton’s pair of gold bracelets. Tissot’s painterly glint on the smooth bangle and expertly-applied highlights on the rope cuff make this jewelry an exquisite focal point of her costume, all the more solid with the juxtaposition of the sketchily outlined, diaphanous trim peeking from her sleeve. In A Type of Beauty (1880), Kathleen Newton’s black lace mitts are delicately painted over her flesh with a small brush. The curves of the rope cuff bracelets, flecked with gold highlights, and the further curves of two layers of wispy white ruffles, keep the volume of her forearm from being flattened out by Tissot’s exacting depiction of the lace’s fine pattern. But Mrs. Newton’s shining curls – just as fine – are loosely described using a soft brush that repeats the highlights of the gold bracelet. The texture of the trim at her sleeve was created with a stiff, square brush whose bristles barely traced the white paint. And he was successful at it: Tissot’s brushwork, in addition to his subject matter and composition, continues to delight and draw us into his paintings. Who could ask for more? This entry was posted in Art blog, Art History, Impressionists and tagged James Tissot, Kathleen Newton on November 15, 2018 by Lucy Paquette, author of The Hammock: A novel based on the true story of French painter James Tissot. French painter James Tissot emigrated from Paris to London in mid-1871, in the chaos after the Franco-Prussian War and bloody Commune, and became successful in Victorian England within a few years. In 1873, he sold Too Early through London art dealer William Agnew (1825 – 1910) – who specialized in “high-class modern paintings” – for 1,050 guineas. Agnew purchased The Ball on Shipboard from Tissot the following year, and in 1875, purchased Hush! directly from the wall of the Royal Academy by for 1,200 guineas. What made Tissot’s paintings “modern”? How were his pictures of everyday life different from those painted by his English contemporaries? James Tissot (1836 – 1902), an astute businessman keenly aware of buyers’ preferences, painted many subjects that his English contemporaries did. But while Victorian painters like George Dunlop Leslie (1835 – 1921) depicted genteel women behaving well – docile and proper – Tissot was a bit daring. Like others, he also painted a woman (his mistress and muse, Kathleen Newton) reading – but his model is a bit of a rebel, wearing eye makeup and a gown with a revealing neckline, improper as a day dress. In Her Favorite Pastime, Leslie presents us with a straightforward rendering of a pretty and sedate woman focused on her book. In Tissot’s Quiet, Kathleen is sitting – quite indecorously – with her legs crossed, somewhat slumped forward, against a racy leopard skin. Yet, the image is of a loving mother, the exhausted girl leaning lovingly against her, and the resting dog underscores the domesticity of the scene while the expansive green lawn behind them indicates the wealth of the household. 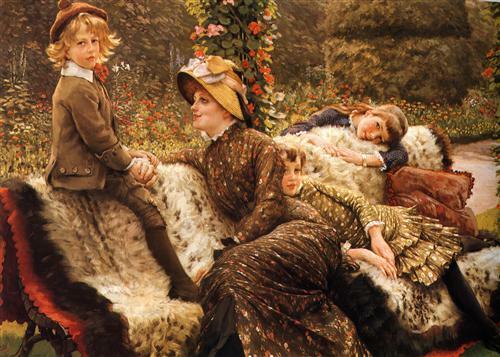 While his English contemporaries depicted the ideal of contented domestic life, with family members often in stiffly posed compositions, Tissot’s showed a casual reality. George Goodwin Kilburne’s The Piano Lesson relies on the single child obediently taking instruction and a symmetrical composition to show us the orderliness of this family’s conduct. 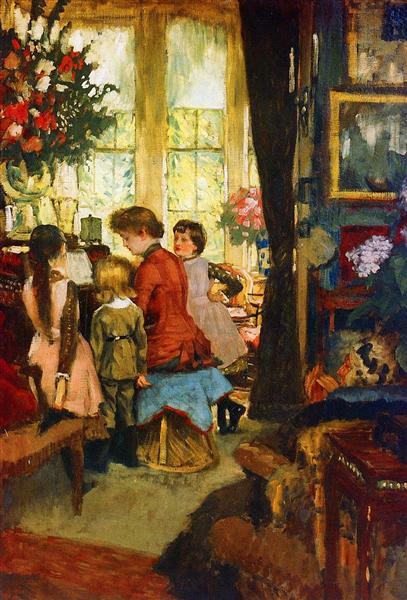 In Kathleen Newton at the Piano, Tissot gives us a peek behind the curtain dividing the formal front parlor from the informal room behind, where Kathleen, her two children, and an older niece huddle affectionately near her as she plays for them. In A Mother’s Darling, Kilburne depicts the girl as a little woman; in The Garden Bench, Kathleen Newton’s son, daughter and niece are children behaving spontaneously. The four pictures of afternoon tea below, two by Leslie and two by Tissot, illustrate Leslie’s literal manner and Tissot’s rather racy take on this British ritual. While Leslie’s lone ladies are being served by a housemaid and dreaming wistfully into the distance, Tissot’s social beings are using the occasion to flirt and sum up available suitors. Below, in Alice in Wonderland, Leslie depicts an iconic family moment as a mother stimulates the imagination of her daughter by reading aloud to her on a stiff sofa, attired in a proper day dress with a bustle. The girl, in her tidy dress, apron and black stockings, has set aside her doll to listen, her dreamy face against her mother’s bosom showing the effect of the story on her imagination. In Reading a Story, Tissot depicts a similar scene in a natural setting, with a mother (Kathleen Newton) informally flipping pages on a comfortably-padded garden bench with a little girl who, though engaged, looks a bit fidgety as well as windblown from outdoor play. Tissot did not portray Victorian poverty, or even attempt to document the reality of the era’s social ills. In the images below, Philip Hermogenes Calderon (1833 – 1898) and George Adolphus Storey (1834 – 1919) depict destitute orphans in an attempt at realism colored with sentimentality. Tissot’s upper-class orphan, accompanied by the expensively-dressed woman modeled by Kathleen Newton, is somber, but sentimental in an essentially decorative way. The pictures below perfectly capture the difference between Tissot’s “modern” paintings and those of his Victorian peers. While Thomas Benjamin Kennington (1856 – 1916) depicts a woman reading a letter, and George Dunlop Leslie shows us a woman who has read a letter and now must consider how to reply, Tissot gives us a woman who, having read her letter, rips it to shreds that billow away in the wind. Kennington’s and Dunlop’s compositions are simple, but Tissot provides an air of tantalizing mystery around his subject: the woman stalks toward us through an elegant, landscaped garden while the remnants of her luncheon, or tea, are being cleared by a footman. Who is she? We are drawn into her drama, and are all the more curious about the contents of her letter. James Tissot, unlike his Victorian peers, did not portray women gathering flowers or gazing at themselves in a mirror, or brides, or women sewing or dancing. But for a cozy scene of a Victorian lady minding her children, he gave us Hide and Seek (left, c. 1877), in which Kathleen Newton lounges in an upholstered armchair, absorbed in a newspaper in a corner of his opulent studio while her children and those of her sister scamper about. While Tissot used the brighter palette of the Impressionists in France, his perspective can be ascribed to his nationality only partially: his subject matter and his innate humor were unique. This entry was posted in Art blog, Art History, Impressionists and tagged George Dunlop Leslie, James Tissot, Kathleen Newton on July 15, 2018 by Lucy Paquette, author of The Hammock: A novel based on the true story of French painter James Tissot. Kathleen Irene Ashburnham Kelly Newton (1854 – 1882) first appeared in James Tissot’s paintings in 1876. Who was she? All we have to know her by are a few biographical facts researched by Tissot scholar Willard E. Misfeldt (b. 1930) and others, and dozens of paintings of Kathleen Newton by James Tissot. According to Dr. Misfeldt, Kathleen Irene Kelly was born in May or June of 1854 in Agra, India. Her mother, Flora W. Boyd, passed away, and she and her brother, Frederick, and elder sister, Mary Pauline (“Polly,” 1851/52 – 1896), were the responsibility of their father, Charles Frederick Kelly (1810 – 1885). Mr. Kelly had been employed at the accountant’s office of the British East India Company in Agra from age 21 or 22 until his retirement to Conisbrough, South Yorkshire, in 1866. At some point around mid-1860, the family began to use Ashburnham as a middle name. Kathleen and Mary Pauline were sent back to England to be educated at Gumley House Convent School, Isleworth. When Kathleen was sixteen, a marriage was arranged for her, and she returned to India to marry Dr. Isaac Newton, a surgeon in the Indian civil service. James Tissot had left Paris following the bloody Commune in 1871, and by early 1873, he had bought the lease on a medium-sized, two-storey Queen Anne-style villa, built of red brick with white Portland stone dressing, at 17 (now 44), Grove End Road, St. John’s Wood. The residents of the comfortable suburban homes around the Regent’s Park and the district of St. John’s Wood, west of the park, were merchants, bankers and lawyers. Tissot’s house was set in a large and private garden separating him from the horse traffic, omnibuses and pedestrians on their way to the park or the still-new Underground Railway station nearby. Kathleen lived just around the corner, and legend has it that she met Tissot while mailing a letter at a postbox. On the Thames (1876), by James Tissot. Oil on canvas, 28.5 by 46.5 in. (72.5 by 118 cm). Hepworth Wakefield Art Gallery, Wakefield, UK. Courtesy of The Bridgeman Art Library for use in “The Hammock: A novel based on the true story of French painter James Tissot” by Lucy Paquette, © 2012. In my previous blog post, James Tissot’s Models à la Mode, I indicated that the shadowy face in the center of The Thames (1876), was likely Tissot’s first painting featuring Kathleen Newton, and that she seems to be the model for one of the figures in Portsmouth Dockyard (c. 1877) as well. Kathleen modeled for dozens of Tissot’s paintings; soon, he was painting her almost exclusively. These pictures form a charming chronicle of their years together. They also portray her rapid evolution from a young beauty travelling with her artist-lover, to a busy, beloved mother, then to a woman struggling with tuberculosis. In Room Overlooking the Harbor (c. 1876-78) Kathleen is on holiday with Tissot. He captured her going about her business while an older man (who could be a servant accompanying the couple) gamely models as well. In 1877, Tissot captured Kathleen’s youthful, glowingly healthy beauty in Mavourneen. In By the Thames at Richmond (c. 1878), a scene based on a photograph that surely was staged, a man (modeled by Tissot or perhaps Kathleen’s brother, Frederick Kelly) is writing “I love you” on the ground while Kathleen reacts with a smile. The girl is likely Kathleen’s daughter, Muriel Violet, who would have been about seven years old at this time. Study for “Mrs. Newton with a Child by a Pool” (c. 1877-78). Virginia Museum of Fine Arts, Richmond, Virginia, USA. In Mrs. Newton with a Child by a Pool (c. 1877-78), Kathleen plays with her son, Cecil, by the ornamental pool in the garden of Tissot’s house in St. John’s Wood. Kathleen is a lovely 24-year-old in A Winter’s Walk (Promenade dans la neige, c. 1878). She is still fresh-faced at 25 in Mrs. Newton with an Umbrella (c. 1879, Musée Baron Martin, Gray, France). In 1879, the couple traveled to Paris, where Tissot used the Louvre as a setting for several paintings featuring Kathleen in her caped greatcoat. Waiting for the Ferry (c. 1878), by James Tissot. Between about 1878 and 1881, Tissot produced a number of paintings featuring Kathleen as a traveler. [See The Art of Waiting, by James Tissot, Tissot and Degas visit the Louvre, 1879 and Victorians on the Move, by James Tissot.] Tissot had painted Kathleen Newton so often in the half-dozen years they spent together that her face became stylized. In the final two years of Kathleen’s life, Tissot captured her looking tired and pale, with dark shadows under her eyes, or bedridden. 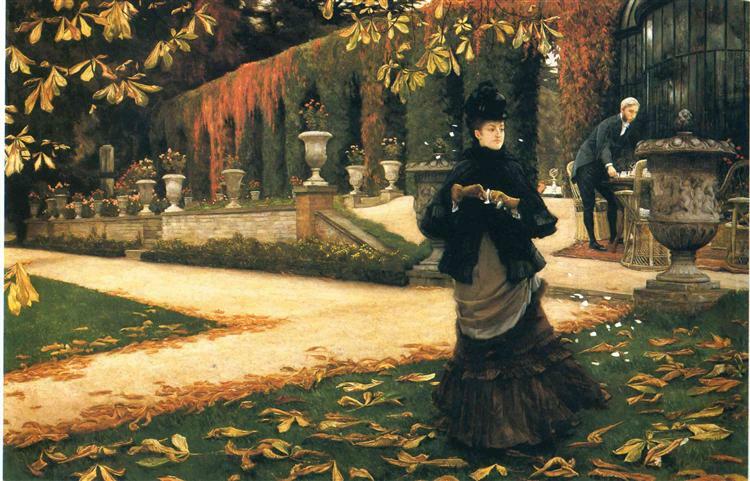 [See James Tissot’s garden idyll & Kathleen Newton’s death.] 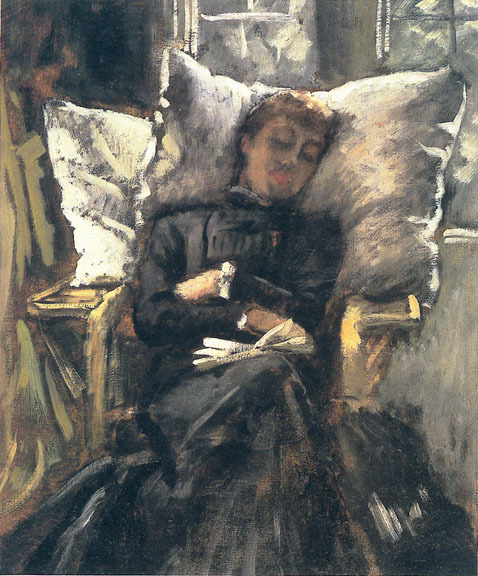 The Victorian Web features a study of Mrs. Newton asleep in a conservatory chair, courtesy of Peter Nahum Ltd, London, dated 1881-82, and the Musée Baron Martin in Gray, France has a painting from the same time period, Mrs. Newton Resting on a Chaise-longue, in which she is propped up on two pillows and looks very ill.
Kathleen Newton died of tuberculosis on November 9, 1882, at age 28, at Tissot’s house with her sister, Polly Hervey, at her side (according to the death register). Tissot draped the coffin in purple velvet and prayed beside it for hours. He tried to contact her through a series of séances. On May 20, 1885, at a séance in London, Tissot recognized the female of two spirits who appeared as Kathleen, and he asked her to kiss him. The spirit is said to have done so, several times, with “lips of fire.” Then she shook hands with Tissot and disappeared. He made this image of the vision to commemorate their reunion. After his death in 1902, James Tissot and his work, and Kathleen Newton, were largely forgotten. By 1930, few, if any, of Tissot’s contemporaries remained to share recollections of the artist. The only biographical material on Tissot publicly available was a twenty-five page journal article published in France in 1906. Kathleen’s daughter, Muriel Violet, died in 1933, and Mrs. Newton’s identity was forgotten – except by her son, Cecil. In 1933, the first exhibition of Tissot’s work was held at the Leicester Galleries in London in 1933: ” ‘In the Seventies’ – An Exhibition of Paintings by James Tissot.” A visitor to this exhibition, a man in his late fifties, stood before one of the paintings of a beautiful woman and declared, “That was my mother,” then walked out. The woman, who appeared in a number of Tissot’s paintings between 1876 and 1882, and whose identity remained unknown into the next decade, was referred to as “la Mystérieuse” – the Mystery Woman. By the late 1960s, Willard Misfeldt was researching James Tissot and Kathleen Newton. I was able to make arrangements for a private tour of Tissot’s home thanks to the kindness of Irish author Patricia O’Reilly. Patricia imagined Kathleen Newton’s life in A Type of Beauty: The Story of Kathleen Newton (1854-1882), © 2010 (cover photo, below left, courtesy of the author). Click here to read it – and click here to read how I’ve imagined Kathleen’s life in The Hammock: A novel based on the true story of French painter James Tissot ), © 2012! This entry was posted in Art blog, Art History, Impressionists and tagged James Tissot, Kathleen Newton on July 13, 2017 by Lucy Paquette, author of The Hammock: A novel based on the true story of French painter James Tissot. An aspect of the fashionable clothing of his day that James Tissot did not fail to capture in paint was mourning. Several of his pictures show mourning attire of the 1860s to the 1880s in great detail. Wearing appropriate mourning attire was one of the many rituals surrounding death in Tissot’s era, particularly in Great Britain when Queen Victoria wore mourning for forty years following the death of her consort, Prince Albert. Numerous etiquette manuals and popular journals laid out the strict and complicated etiquette of dress that demonstrated respect for the deceased, earned sympathy for the grieving, and often displayed wealth and social status. Different rules applied depending on the bereaved person’s relationship to the deceased person, from grandparents to cousins to servants. In 1869, James Tissot exhibited A Widow (Une veuve, 1868) at the Salon in Paris. The low-cut, square neckline of this stylish young widow’s full-skirted black gown is filled in with a blouse of filmy black silk, trimmed at the round neckline, center front, shoulders and wrists with frothy ruffles in the same fabric. The set-in sleeves and long and full. The trained skirt’s high waist is tied with a wide sash and accented with a black rosette. The pleated flounce at the hem reveals her white, lace-edged petticoat, a black silk stocking, and a squared-toed high heel with its silk bow. Her brown hair is parted in the center, and braids behind each ear crown her head. Wearing black lace mitts as she dreamily pursues her sewing – while showing that glimpse of ankle so tantalizing to Victorian men – it is likely she can be induced to leave off her last months of mourning. The elderly chaperone is in mourning, while the little girl is not. Tissot’s double portrait The Empress Eugénie and the Prince Impérial in the Grounds at Camden Place, Chislehurst (c. 1874) depicts the exiled French Empress (1826 – 1920), living outside London after the collapse of the Second Empire, and her son, Louis-Napoléon Bonaparte, who would be killed in 1879, at age 23, in the Zulu War. The only child of Napoléon III of France, he was accepted to the Royal Military Academy, Woolwich, in 1872 and is pictured in the uniform of a Woolwich cadet. The Empress is in her first year of mourning following the death of her husband in January, 1873. Her black gown consists of a high-necked, button-up bodice with long, tight-fitting, set-in sleeves over a white blouse, and a straight, trained skirt with a black draped tablier (apron) overskirt. Her round black cap, so like her son’s, is trimmed in white, and a long black veil trails from its back. Tissot exhibited The Widower (1876) at the Grosvenor Gallery in 1877. He portrays this widower with a lumpy, crushed hat of soft felt, wearing a sack coat. The bereaved man appears so much sadder than if he were dressed in a dapper frock coat and top hat. Orphans (L’Orpheline, 1879), features Tissot’s mistress and muse, Kathleen Newton (1854 – 1882) and was exhibited at the Grosvenor Gallery in 1879. Mrs. Newton’s form-fitting mourning gown was the very latest style – the new cuirasse bodice and Princess line seaming created by couturier Charles Worth. Fitted over a white blouse with lace showing at the wrists under the long, slim, set-in sleeves, it is a different style of gown altogether from previous Victorian dresses. It has no waist seam: the seams run continuously from the shoulder to the hem, and the shape is created by sewing long, fitted fabric pieces together. Note the center front of her gown, a vertical section of pleated bands. The Princess seam created a tall, slender look. It depended on the curaisse bodice, a tightly-laced, boned corset that encased the torso, waist, hips and thighs. The result was a dramatic narrowing of the silhouette of women’s fashion in the late 1870s. Mrs. Newton wears black lace mitts, a peaked bonnet embellished with black feathers, and a heavy black scarf around her neck. She wears a corsage of lavender and white chrysanthemums, but no jewelry except for the wedding band visible on the third finger of her left hand. It is likely that she is being represented as a widow in her secondary mourning, as lavender was considered a color appropriate for that stage. The little girl [modeled by Kathleen Newton’s niece, Lilian Hervey (1875 – 1952)] also wears mourning – though, oddly, she seems dressed for different weather entirely in her short-sleeved, button-down black dress over a white chemise. She has bare arms and legs and wears white socks with black strapped shoes. The Rivals (I rivali, 1878-79), by James Tissot. Private Collection. Tissot’s The Rivals (I rivali, 1878–79) is set in the conservatory of his home at 17 (now 44), Grove End Road in St. John’s Wood, London. It casts his mistress, young divorcée Kathleen Newton, as a young widow, crocheting while taking tea with two suitors, one middle-aged and one old. Mrs. Newton is wearing the same black gown she did in L’Orpheline (Orphans, 1879). In this picture, Tissot paints her so close to the end of her mourning that she is entertaining men – and so nonchalant about it that she slouches in her fur-lined, wicker armchair while focusing on her needlework! Tissot exhibited this painting at the Grosvenor Gallery in 1879. Kathleen Newton died of tuberculosis on November 9, 1882, at age 28, at Tissot’s house with her sister, Polly Hervey, at her side (according to the death register). Tissot draped the coffin in purple velvet and prayed beside it for hours. Immediately after the funeral on November 14, at the Church of Our Lady in Lisson Grove, St. John’s Wood, Tissot abandoned his home and returned to Paris. Tissot exerted himself to re-establish his reputation in Paris, which he had fled following the bloody aftermath of the Franco-Prussian War in 1871, with a series of fifteen large-scale pictures called La Femme à Paris (The Parisian Woman). Painted between 1883 and 1885, they portrayed the fashionable parisienne in various incarnations using brighter, modern colors than he had in his previous work. The elegant young widow in Sans dot (Without Dowry, 1883-85) takes the air in the gardens in Versailles wearing a buttoned-up, high-necked black bodice with three-quarter, eighteenth-century-style Sabot sleeves that fit tightly before flaring into a deep ruffle below the elbow. Black gloves cover her hands and forearms. She wears a black draped tablier (apron) overskirt over a straight, pleated underskirt in sable-colored silk. Her high-crowned, black straw bonnet features a large black bow over her fringe, echoed by a soft bow tied neatly under her chin. Because her bonnet is so elaborately beribboned and has no veil, we know she is past her first year of mourning (when the appropriate bonnet was simple, like the one shown at the right) and is now in secondary mourning. The widow maintains a wistful expression and a demure posture before her work basket and a book while her elderly chaperone, who is wearing mourning and a bonnet with a veil, is absorbed in the newspaper. She appears completely aware of her charms – and of the fact that her lack of a dowry seems unlikely to affect her ability to attract another husband. © Copyright Lucy Paquette 2017. All rights reserved. This entry was posted in Art blog, Art History, Impressionists and tagged Empress Eugénie, James Tissot, Kathleen Newton on January 20, 2017 by Lucy Paquette, author of The Hammock: A novel based on the true story of French painter James Tissot.